Looks like Amazon is running a similar promotion on the Moto G4 Plus. You can grab the 16GB model for $159.99, though this price is limited to the black version. This is, by far, the lowest we've seen the Moto G4 Plus, even beating out the time when Amazon had it for $190. For $160, you get a 5.5" 1080p display, Snapdragon 617, 2GB of RAM, microSD slot, 16MP camera, 3,000mAh battery, and a fingerprint sensor. The 64GB black model is also on sale, but for a paltry $15 off. Remember that this deal is only good through today before Best Buy moves onto the next thing. Be sure to pick one of these guys up if you're interested. Looks like Amazon is running a similar promotion on the Moto G4 Plus. You can grab the 16GB model for $159.99, though this price is limited to the black version. Check it out here. 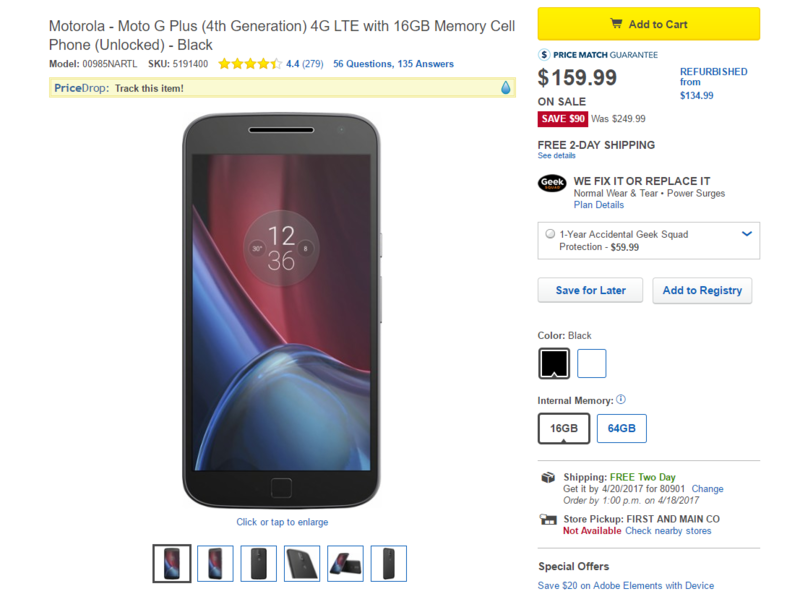 The sales at Amazon and Best Buy are over, but now you can get the same 16GB Moto G4 Plus for $160 at eBay. Just remember to apply the coupon code PSHOPSAVE15 at checkout to receive the full discount. You can find the listing at the source link below.